Deep frying things, that is. It's been years now since I've wanted to deep fry dough and other things in hot oil. I blame my junior year of prom, when, after prom a group of us went to a friend's house and her parents had a plate of homemade beignets sitting on their kitchen counter. Yes, beignets. They were golden brown and covered in powdered sugar and were pure decadence. My friend's mom was excitedly telling us how she was finally putting to use the deep fryer she had received for Christmas. The beignets were perfection. They were a nice surprise and much appreciated from everyone in the group, especially after a night of dancing, being awkward, and eating bad prom food that was probably either dry chicken or pasta. I've constantly reminded myself of the calories, the cleanup, the labor involved that made frying things not worth it. But after being stuck inside all weekend from rain due to Hurricane Harvey, I decided it was high time to make what I've always wanted to make: homemade yeast doughnuts. The spice from the cardamom reminded me of Fall and with the cooler weather we've been experiencing, it almost feels like it could actually be Fall. But this is Texas, so we all know that is not true. As much as I love summer and all the things associated with it, after this weekend I am pretty eager for Fall to be here. 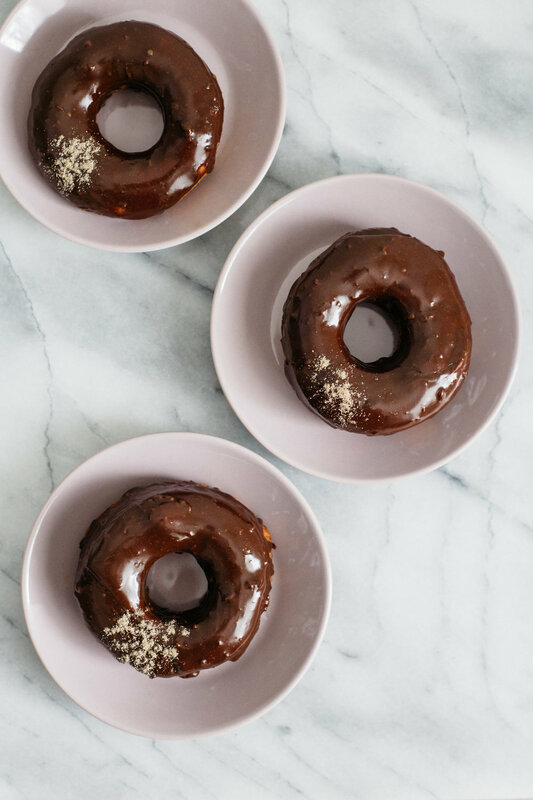 If you are right there with me, then these doughnuts might help get you there, or at least create the illusion that Autmn is near. But on a more serious note, I am incredibly grateful that the only thing we had to worry about this weekend was if the oil was hot enough to fry these or if the dogs were muddy from all the rain outside. The devastation in Houston, Rockport, and other surrounding areas is completely shocking. I am so sad for some of the families I know and others who have lost so much from Hurricane Harvey. We are praying over here for Houston and that the road to recovery is smooth, although I know it will be a long time coming. Directions: In a large bowl or liquid measuring cup, microwave the milk until warm but not hot. Sprinkle in the yeast packet, and let sit for 5 minutes or until foamy. In the bowl of a stand mixer fitted with the dough hook, combine the eggs, butter, sugar, salt, cardamom, and cinnamon with the yeast mixture. Add in 2 cups of the flour and mix until combined. Add in the rest of the flour (2 1/4 cups) and mix until combined and the dough forms a ball. The dough should become too thick to beat in the mixer. If the dough is still too wet, add in a little more flour (2 tablespoons at a time) until smooth. Punch the dough down and dump onto a lightly floured surface. Using a rolling pin, roll out until dough is 1/2 inch thick. 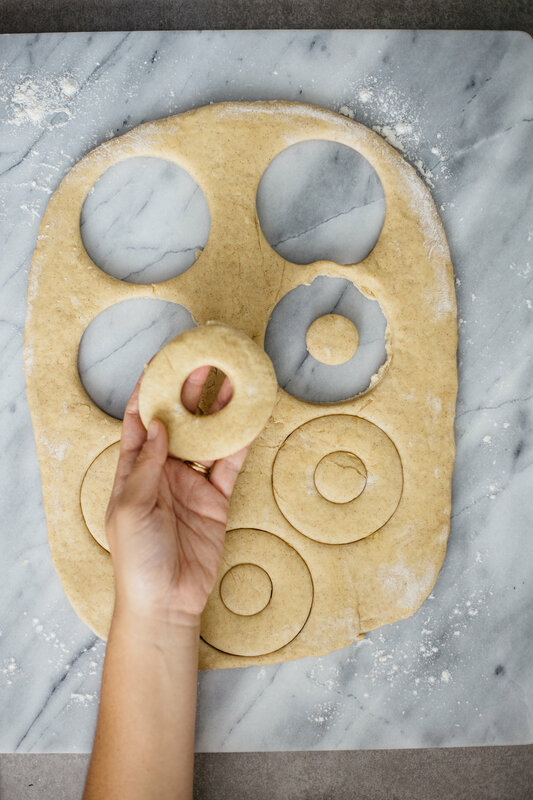 Cut out the doughnuts with 2 circle cookie cutters (the larger one should be close to 3 inches). Keep the doughnut holes! Carefully knead any scraps back together and roll back out to make more doughnuts. 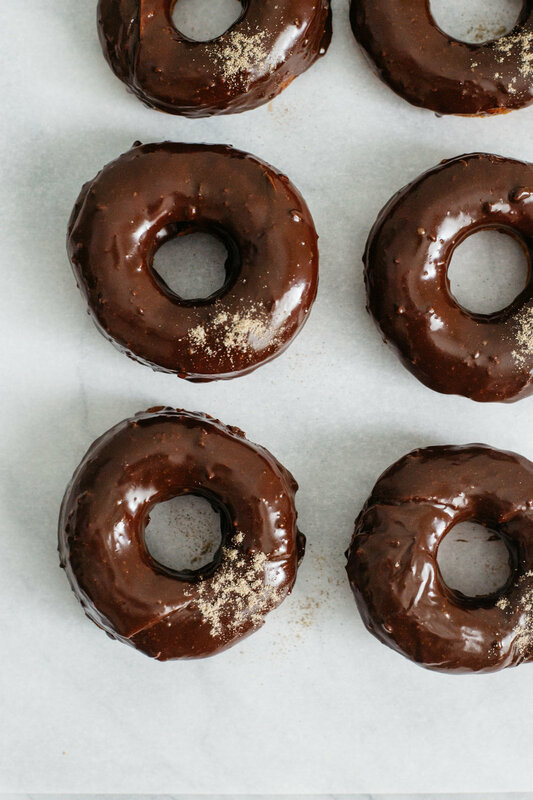 Spread doughnuts out on 2 baking sheets and cover with a kitchen towel. Allow to rise until doubled in size, another 45 min - 1 hour. Meanwhile, make the glaze! Heat milk or cream in a separate bowl in the microwave until very hot. Alternatively, bring to a boil in a small saucepan. In a small bowl, mix together the chocolate, sugar, cardamom, vanilla and salt. Pour the milk over the chocolate mixture and let sit for 2 minutes without stirring. Whisk until smooth and then set aside in the refrigerator to let thicken. 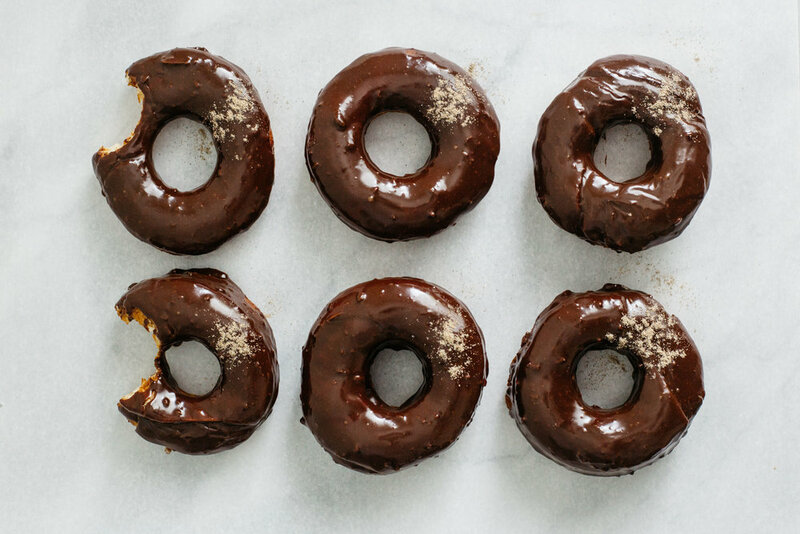 Using a metal slotted frying spoon or spatula, carefully add a few doughnuts to the oil. Don't overcrowd the pot. Fry for approx. 45 seconds, or until the bottoms are a deep golden color. Flip over and cook until the other side is golden. 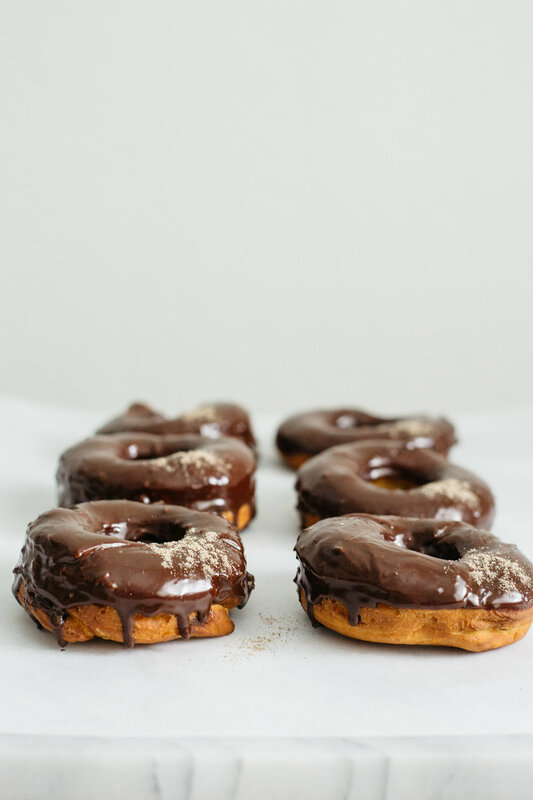 Transfer doughnuts to the cooling rack and repeat with remaining doughnuts. Dip in the glaze, and enjoy!